Lots of features and tools. Great gift. Seems to be good quality. I am happy with the product. :) I think it is a great gift for dads. Loved this, got it for one of my ushers who's 14. I'm sure he'll love it with his name engraved on it and it doesn't look cheap at all. The Steel Army Knife looks great. It's delivered in a silver, professional tin box, which is then placed in a plain white box. This helps because now I can present the gift to them without having to buy another box. It looks great; the only thing I would give as a "con" is that the engraved font is faint. Other than that, it's what I was looking for. Good price, great product. I'm sure my groomsmen will enjoy it. Great gift for our groomsmen. This knife was about 100Xs better than what I expected it to be - the engraving was beautiful. Everything unfolded smoothly. It was nice and heavy, which is a must for a good pocket knife. And you can't beat the price. This item is great. I thought that it was going to look cheap and it is the exact opposite. The engraving is neat and clean. Any guy that receives this will love it. I gave this gift to my grooms men and my best man. They liked it a lot. This was absolutely perfect for gifts for our groomsmen. They are the outdoors type, and having these army knives personalized make them more elegant, but usable from a man's point of view. Just wonderful! Bought this for the ring bearer who's an avid camper! Very high quality, more than expected! Worth more than what I paid for it! Love the personalization. My favourite item in my order!!! We bought these along with luggage tags for our groomsmen! They are super durable and come in an elegant silver case that is tops for presentation. We also personalised them for added flare. I would definitely recommend these!!! He'll be a modern-day MacGyver with this ultra-sleek rubber grip army pocket knife. 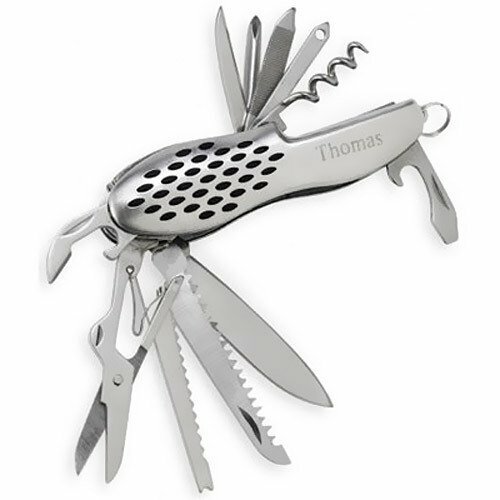 This high-quality stainless steel Swiss army knife comes complete with thirteen different functions including a screwdriver, nail file, scissors, knife, corkscrew and bottle opener. Superior craftsmanship ensures this tool will be at the ready in any sticky situation. Engrave with a name or a personalized message and give as groomsmen's gifts or as bachelor party favors. Select up to two lines of customized text (twelve characters per line). Features rubber grips and includes a keychain attachment. Each knife measures 2.25"L x 0.5"W—pocket sized for easy access while he's on the go.